Google's warning that it might pull out of China over cyber attacks has surprised human rights activists here. They seem unfazed that China is accused of trying to hack into their Gmail accounts. But a major foreign firm like Google being prepared to speak out and challenge the government so directly is unusual. The Chinese authorities will be infuriated that Google has made its announcement before negotiations with officials have got under way. China has so far said little publicly in response. An unnamed official quoted by the state news agency Xinhua said only that the authorities were trying to find out more about Google's suggestion it might leave the country. The company's main Chinese rival Baidu is less reticent. In a blog post that has since been taken down, the firm's chief architect Sun Yunfeng claimed Google was just trying to play down its market failure. "Would Google top executives still proclaim that they would 'do no evil'," he said, quoting the company's code of conduct, "and quit China if they had taken 80% of China's search market?" Google's market share is estimated to be around 30% in China, about half the size of Baidu's, the search engine market leader. The senior Baidu executive said the American company's move would "satisfy the imagination of those Westerners who have never been to China and understand nothing of China but still like to point fingers at China". Others in the technology sector here see this differently. Dan Sefarty heads Viadeo, the firm that owns the Chinese social networking site Tianji.com. "Google is rare," he says. "It's a US company succeeding in China. It has impressive market share and is atypical among other foreign companies who try to get into this very tough market." He warns that Baidu has strong links with the government and may be lobbying hard to gain business advantage from this row. "I would bet on a harsh reaction from the Chinese government," he says. "Look at what they have done with Facebook and Twitter, which have been blocked in China for six to nine months now." Opinion is divided over whether or not Google really plans to withdraw from the country, the world's largest internet market. Duncan Clark, an analyst at the Beijing hi-tech consultancy BDA, says he sees a "mismatch" in perception between the Chinese authorities and the foreign firms doing business here. "People here think no-one can do without China, and I think now some companies are thinking no-one can deal with China," he told the French news agency AFP. "There is a feeling that China is emboldened and that they don't need to have the same sort of dialogue [as before]," he said. 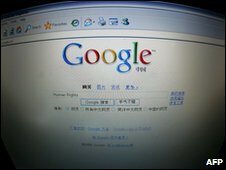 Google's senior US executives are well aware of the Chinese preference for gradual change, and also of the authorities' likely resistance on a matter of such ideological importance to them as control of the internet, an arena described by a senior public security official just a few weeks ago as a "battlefield". Some analysts see Google's announcement as a gambit for what will be extremely tough negotiations with the Chinese, rather than an ultimatum. 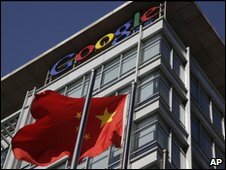 But others suggest that the more Google bent towards the demands of the Chinese government, the more harm was done to its reputation overseas, and at some point it had to make a stand. Whether you regard Google's market share as impressive or disappointing, compared to its dominance elsewhere, there is little doubt it is not a household name in China in the same way that it is abroad. But Hu Li, a student in Beijing, told the BBC he admired what he called the company's "heroic" decision to offer an unfiltered service, and hailed the announcement to pull out if it could not reach its objective. 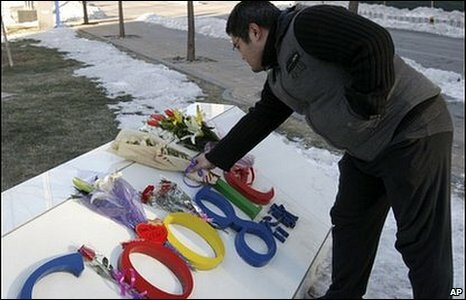 Some people even laid flowers outside the company's Beijing headquarters, in the hi-tech Haidian district, as a mark of respect. But this sentiment was certainly not shared by everyone. Another man, an IT worker who would only give his surname, Zhong, said the American firm should respect China's situation regarding this kind of issue. "China has been using censorship for a long time," he said. "Any change can only happen slowly - it won't happen overnight."